The reality of congregational and conference youth ministry is changing. Conference has been aware of this. Two years ago the Board invited a taskforce to review how conference equips youth ministers, leaders and the youth. John was a part of this process. The task force results and recommendations should be available in the next months. 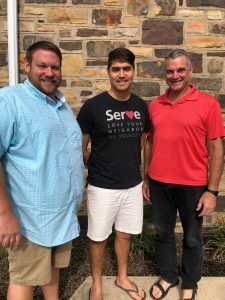 In August, John and his wife Paula relocated to Harrisonburg, VA where Paula began a pastoral role at Park View Mennonite Church. Before leaving, John helped to develop an interim plan for continuing Conference youth ministry. Recognizing that youth ministry requires the work of many, three youth pastors have volunteered to serve in the following roles for the next school year: Brent Camilleri, associate pastor of Deep Run East, is assuming leadership for facilitating the ongoing monthly youth pastor gathering; Mike Ford, pastor of youth at Blooming Glen Mennonite Church, is coordinating the Spring Junior High Late Night Blast; Danilo Sanchez, associate pastor of Whitehall and co-pastor of Ripple, will continue to serve on Mennonite Church USA Youth Ministry Council and be a liaison to the denomination. Conference is grateful for the willingness and readiness of Danilo, Mike and Brent, who bring long histories of service and leadership in our Conference to carry extra responsibilities over the next months ensuring our youth and their leaders continue to be supported and equipped. This interim arrangement gives Conference time to continue the review process and discernment before making any long-term decisions regarding Conference youth ministry. We value your prayers for continued discernment in next steps as we together imagine Conference-wide youth ministry into the future that is rooted in our shared Anabaptist values and carries out our shared priorities of (trans)formation that is both missional and intercultural in the way of Christ’s peace.